On testing | Teacher, Becoming. However, Ayers definitely believes we can learn things from standardized tests. Like the bias of those who wrote them. 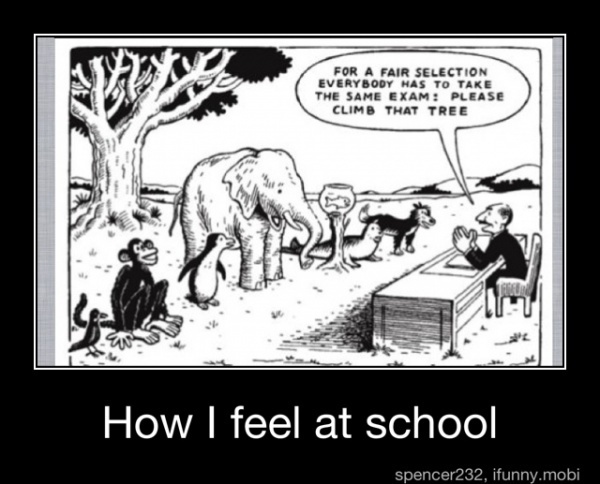 I found this cartoon on Pinterest and was struck by how aptly it applies to Ayers’ disgust for standardized tests. How do you feel about standardized testing? I think there’s a place for them, but they are way too heavily relied upon as the ultimate gauge of student and teacher performance. If the tests were cheaper and way less important, I think people wouldn’t mind them so much. I think that they have their place, but we put way too much stock in them. I’ve worked with students who base their academic self-worth on the fact that they didn’t pass the WASL. Teachers who are told their jobs depend on how their students do on the tests aren’t going to be good teachers, they’re going to teach to the test. So we’re just creating a generation of kids who can take tests but not solve real problems. As Captain Jack Sparrow would say, “they are just guidelines.” And should be used as such. We shouldn’t be accepted into the Teacher Certification program solely based on our WEST-B scores any more than a student should be accepted into Yale based only on their SAT scores. I never thought about how biased the tests were before our class readings and seeing some examples of this bias is striking. Yet we are stuck with the tests. What can we do? Do we teach our kids how to pass them? There is an art to test taking after all. This is a hot topic and the politicians have gotten involved. We have a long bumpy road ahead of us and standardized tests are just one of our obstacles.